Police say the suspect entered through the home's garage after finding the remote garage door opener in an unlocked vehicle in the driveway. 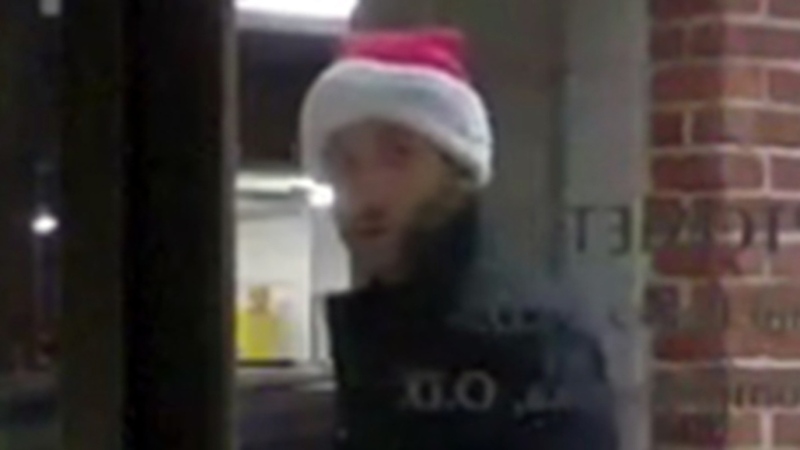 Police on the Peninsula are investigating after a burglary suspect in a Santa hat allegedly broke into a home, stole the keys to the resident’s family-owned optometry business, then went to San Francisco to burglarize the business. Hillsborough police say the man seen in a YouTube video posted Friday burglarized the home in the San Raymundo Road / Robin Road neighborhood sometime late on Christmas Eve or early Christmas morning. The suspect entered the home through the garage by stealing the remote garage door opener from an unlocked vehicle in the driveway, police said. He "stole various items" then left the Hillsborough home and traveled to the family’s San Francisco business, City Optometry on Bush Street, at about 3 a.m., police said. Hillsborough police did not say what, if anything, was stolen from the business, and the victim, Katherine Morioka, told NBC Bay Area on Friday she hasn't yet been to the shop to take inventory. Morioka showed NBC Bay Area additional security video that shows the suspect appear undeterred by a camera recording the front door and not afraid to talk to the security guard who checks on the alarm. "He trips the alarm, because it's motion-sensored," Morioka said. "Now he tells the guard he is my partner's nephew. He actually locks the door," a move that threw the security guard off long enough for him to get away. Hillsborough police are collecting video evidence from neighboring businesses and from Morioka's neighbors. Morioka said she's grateful no one got hurt and is hoping police make an arrest quickly. She also has some advice for people with garage door openers. "Don't leave your garage door opener in the car if its outside," she said. "That's the most important thing." Anyone who recognizes the suspect in the video is asked to contact the Hillsborough Police Department.